Tesa precision tools and gages rank among the very finest in workmanship, durability, reliability and accuracy. This sophisticated, premium quality Swiss made inch or metric micrometer gives parallax-free analog readings of 0,001 mm or .0001" on the vernier. It is not an electronic digital micrometer but totally mechanical. The digital counter indicates 0,1 mm or .005" increments for faster reading. These micrometers are not toys (although they are fun to play with). The spindle operates so smoothly, and the digital numbers turn so imperceptibly that you'll wonder how they did it. We could say that it will provide you with hours of enjoyment, but you've probably got work to do. Smoothly operating friction thimble gives excellent repeatability of measurement. Measuring force is 10 N maximum. Comes with a hard plastic case and serial number suitable for ISO compliance. Manufacturer's certificate of calibration, with data, is included. With prices starting at $300 these micrometers are understandably not big sellers. Stock is often low or non-existent. If you click on "internet discount" you will quickly find the current price—sometimes with a discount or free shipping—and the stock situation. If you are so inclined, go ahead and place an order. The links we give you are to a genuine Tesa distributor and you will be guaranteed to receive the original item, not a Chinese rip-off. Amazon has friendly return policies and if you ever need repair service, even warranty service, keep us in mind. Tesa does not make any Tesamaster micrometers larger than 4 inches. Here's the important part: you can be assured of many useful years from this micrometer because we service what we sell. If there are ever any problems, whether during the 1-year warranty or afterwards, please return it to us. We have spare parts in stock and over 40 years of factory-trained experience. Carefully clean the exposed areas of the spindle well as the measuring faces. Except for the 0-25 mm (0-1") model, it will be necessary to use a gage block or micrometer setting standard. 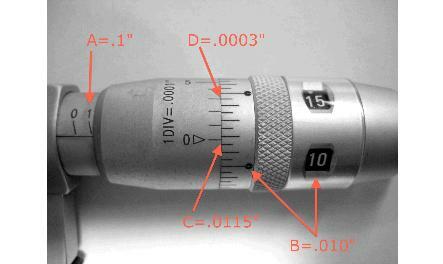 The micrometer and the gage block or standard must be at the same temperature. Allow them to acclimatize and stabilize for several hours if necessary. Close the measuring faces using the spindle's friction sleeve. For small deviations you can rotate the barrel slightly by using the setting key (supplied). There is a small hole near the front of the barrel for this purpose. For larger deviations, unscrew the end cap, loosen the lock screw using the 2 mm Allen wrench (supplied) and adjust the thimble into the proper position. Reassemble the micrometer. Repeat the measurements as necessary until the display reads correctly. End user maintenance is not recommended and, if necessary, the micrometer should be returned to a repair shop such as Long Island Indicator Service. Admittedly, it isn't easy at first. Spend some time with it and you will be able to figure it out. The illustration, left, is for the metric model but the same principles apply for the inch models. A: Where the barrel reads 1, it equals .1" and so forth. C: If you have gone beyond the line with the black dot, you increase the value by .0005" per line. Thus, if you have gone over by three lines (one long line and one short line), you will have travelled .0015" (three times .0005"). D: Finally, you use the vernier to decipher the .0001" Check to see which line on the vernier matches one of the lines on the thimble. If it is the third line, then you have travelled another .0003" (three times .0001"). If there is no perfect match between lines, then you can interpolate if you wish. Adding it all up, your reading will be .1118"